fence Archives • A Talking Cat!?! After a quick (who am I kidding, it’s long) shot of a beautiful sewer culvert, we cut from the living room to outside the living room. Certainly, a change of location that deserves more lingering establishing shots. It’s time for horrible mother Susan to try and not be horrible for once. She has done a lot of yelling at her dumb kids for being dumb. Must be time to tell Trent he isn’t dumb, the big dummy. Trent, you idiot! 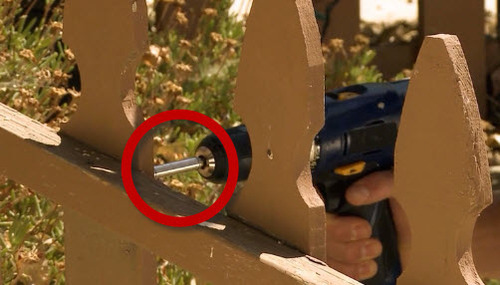 Why are you using a drill bit extension? How deep do you plan on screwing? Enough double entendre. Susan comforts Trent a bit. Makes sure he doesn’t think he’s dumb because she doesn’t think he’s dumb. He just doesn’t know what he wants to do with his life. Maybe a hug will make things better. Nope. Now Trent is more depressed than ever. Better go back to drilling some wood. Good scene, everyone. That’s a wrap. Grab some off brand M&Ms at the craft services table and be ready to go in 5.